It is missing citations or footnotes. Please help improve it by adding inline citations. Tagged since June 2009. It needs additional references or sources for verification. Tagged since October 2007. A bellhop is an example of a service occupation. A service is the intangible equivalent of an economic good. Service provision is often an economic activity where the buyer does not generally, except by exclusive contract, obtain exclusive ownership of the thing purchased. The benefits of such a service, if priced, are held to be self-evident in the buyers willingness to pay for it. Public services are those society pays for as a whole through taxes and other means. By composing and orchestrating the appropriate level of resources, skill, ingenuity,and experience for effecting specific benefits for service consumers, service providers participate in an economy without the restrictions of carrying stock (inventory) or the need to concern themselves with bulky raw materials. On the other hand, their investment in expertise does require consistent service marketing and upgrading in the face of competition which has equally few physical restrictions. Many so-called services, however, require large physical structures and equipment, and consume large amounts of resources, such as transportation services and the military. Providers of services make up the tertiary sector of the economy. Services can be paraphrased in terms of their generic key characteristics. Services are intangible and insubstantial: they cannot be touched, gripped, handled, looked at, smelled, tasted or heard. Thus, there is neither potential nor need for transport, storage or stocking of services. Furthermore, a service cannot be (re)sold or owned by somebody, neither can it be turned over from the service provider to the service consumer nor returned from the service consumer to the service provider. Solely, the service delivery can be commissioned to a service provider who must generate and render the service at the distinct request of an authorized service consumer. The service relevant resources, processes and systems are assigned for service delivery during a definite period in time. If the designated or scheduled service consumer does not request and consume the service during this period, the service cannot be performed for him. From the perspective of the service provider, this is a lost business opportunity as he cannot charge any service delivery; potentially, he can assign the resources, processes and systems to another service consumer who requests a service. Examples: The hair dresser serves another client when the scheduled starting time or time slot is over. An empty seat on a plane never can be utilized and charged after departure. When the service has been completely rendered to the requesting service consumer, this particular service irreversibly vanishes as it has been consumed by the service consumer. Example: the passenger has been transported to the destination and cannot be transported again to this location at this point in time. The service provider is indispensable for service delivery as he must promptly generate and render the service to the requesting service consumer. In many cases the service delivery is executed automatically but the service provider must preparatorily assign resources and systems and actively keep up appropriate service delivery readiness and capabilities. Additionally, the service consumer is inseparable from service delivery because he is involved in it from requesting it up to consuming the rendered benefits. Examples: The service consumer must sit in the hair dresser's shop & chair or in the plane & seat; correspondingly, the hair dresser or the pilot must be in the same shop or plane, respectively, for delivering the service. Services are rendered and consumed during the same period of time. As soon as the service consumer has requested the service (delivery), the particular service must be generated from scratch without any delay and friction and the service consumer instantaneously consumes the rendered benefits for executing his upcoming activity or task. Each service is unique. It is one-time generated, rendered and consumed and can never be exactly repeated as the point in time, location, circumstances, conditions, current configurations and/or assigned resources are different for the next delivery, even if the same service consumer requests the same service. Many services are regarded as heterogeneous or lacking homogeneity and are typically modified for each service consumer or each new situation (consumerised). Example: The taxi service which transports the service consumer from his home to the opera is different from the taxi service which transports the same service consumer from the opera to his home – another point in time, the other direction, maybe another route, probably another taxi driver and cab. Each of these characteristics is retractable per se and their inevitable coincidence complicates the consistent service conception and make service delivery a challenge in each and every case. Proper service marketing requires creative visualization to effectively evoke a concrete image in the service consumer's mind. From the service consumer's point of view, these characteristics make it difficult, or even impossible, to evaluate or compare services prior to experiencing the service delivery. Mass generation and delivery of services is very difficult. This can be seen as a problem of inconsistent service quality. Both inputs and outputs to the processes involved providing services are highly variable, as are the relationships between these processes, making it difficult to maintain consistent service quality. For many services there is labor intensity as services usually involve considerable human activity, rather than a precisely determined process; exceptions include utilities. Human resource management is important. The human factor is often the key success factor in service economies. It is difficult to achieve economies of scale or gain dominant market share. There are demand fluctuations and it can be difficult to forecast demand. Demand can vary by season, time of day, business cycle, etc. There is consumer involvement as most service provision requires a high degree of interaction between service consumer and service provider. There is a customer-based relationship based on creating long-term business relationships. Accountants, attorneys, and financial advisers maintain long-term relationships with their clientes for decades. These repeat consumers refer friends and family, helping to create a client-based relationship. and, finally, consumed and utilized by the triggering service consumer for executing his/her upcoming business or private activity. 1. Service Consumer Benefits describe the (set of) benefits which are triggerable, consumable and effectively utilizable for any authorized service consumer and which are rendered to him as soon as he trigger one service. The description of these benefits must be phrased in the terms and wording of the intended service consumers. 2. Service-specific Functional Parameters specify the functional parameters which are essential and unique to the respective service and which describe the most important dimension(s) of the servicescape, the service output or the service outcome, e.g. maximum e-mailbox capacity per registered and authorized e-mail service consumer. 3. Service Delivery Point describes the physical location and/or logical interface where the benefits of the service are triggered by and rendered to the authorized service consumer. At this point and/or interface, the preparedness for service delivery readiness can be assessed as well as the effective delivery of the service itself can be monitored and controlled. 4. Service Consumer Count specifies the number of intended, clearly identified, explicitly named, definitely registered and authorized service consumers which shall be and/or are allowed and enabled to trigger and consume the commissioned service for executing and/or supporting their business tasks or private activities. the specified service benefits are comprehensively rendered to any authorized triggering service consumer without any delay or friction. The time data are specified in 24 h format per local working day and local time, referring to the location of the intended and/or triggering service consumers. 6. Service Support Times specify the determined and agreed times of every day of the week when the triggering and consumption of commissioned services is supported by the service desk team for all identified, registered and authorized service consumers within the service customer's organizational unit or area. The service desk is/shall be the so called the Single Point of Contact (SPoC) for any service consumer inquiry regarding the commissioned, triggered and/or rendered services, particularly in the event of service denial, i.e. an incident. During the defined service support times, the service desk can be reached by phone, e-mail, web-based entries and/or fax, respectively. The time data are specified in 24 h format per local working day and local time, referring to the location of the intended service consumers. 7. Service Support Languages specifies the national languages which are spoken by the service desk team(s) to the service consumers calling them. the full resumption and complete execution of the service delivery to the content of the affected service consumer. 10. Service Delivering Duration specifies the promised and agreed maximum period of time for effectively rendering all specified service consumer benefits to the requesting service consumer at his currently chosen service delivery point. 11. Service Delivery Unit specifies the basic portion for rendering the defined service consumer benefits. The service delivery unit is the reference and mapping object for the Service Delivering Price, for all service costs as well as for charging and billing the consumed service volume to the service customer who has commissioned the service delivery. fixed price per particularly consumed service delivering unit. Many business theorists view service provision as a performance or act (sometimes humorously referred to as dramalurgy, perhaps in reference to dramaturgy). The location of the service delivery is referred to as the stage and the objects that facilitate the service process are called props. A script is a sequence of behaviors followed by all those involved, including the client(s). Some service dramas are tightly scripted, others are more ad lib. Role congruence occurs when each actor follows a script that harmonizes with the roles played by the other actors. In some service industries, especially health care, dispute resolution, and social services, a popular concept is the idea of the caseload, which refers to the total number of patients, clients, litigants, or claimants that a given employee is presently responsible for. On a daily basis, in all those fields, employees must balance the needs of any individual case against the needs of all other current cases as well as their own personal needs. Under English law, if a service provider is induced to deliver services to a dishonest client by a deception, this is an offence under the Theft Act 1978. The dichotomy between physical goods and intangible services should not be given too much credence. These are not discrete categories. Most business theorists see a continuum with pure service on one terminal point and pure commodity good on the other terminal point. Most products fall between these two extremes. For example, a restaurant provides a physical good (the food), but also provides services in the form of ambience, the setting and clearing of the table, etc. And although some utilities actually deliver physical goods — like water utilities which actually deliver water — utilities are usually treated as services. In a narrower sense, service refers to quality of customer service: the measured appropriateness of assistance and support provided to a customer. This particular usage occurs frequently in retailing. 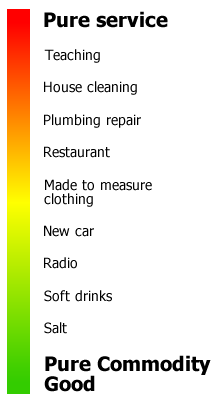 The following is an incomplete list of service industries, grouped into rough sectors. Parenthetical notations indicate how specific occupations and organizations can be regarded as service industries to the extent they provide an intangible service, as opposed to a tangible good. Below is a list of countries by service output in 2009. Output is in millions of US$. James A. Fitzsimmons, Mona J. Fitzsimmons: Service Management - Operations, Strategy, Information Technology - s.
Pascal Petit (1987). "services," The New Palgrave: A Dictionary of Economics, v. 4, pp. 314–15. Alan Pilkington, Kah Hin Chai, “Research Themes, Concepts and Relationships: A study of International Journal of Service Industry Management (1990 to 2005),” International Journal of Service Industry Management, (2008) Vol. 19, No. 1, pp. 83–110. This page was last modified on 26 April 2011 at 01:42.